Last 17th of April 2012, the Argentine government proclaimed the nationalization of YPF, the main oil and industrial company of this country. 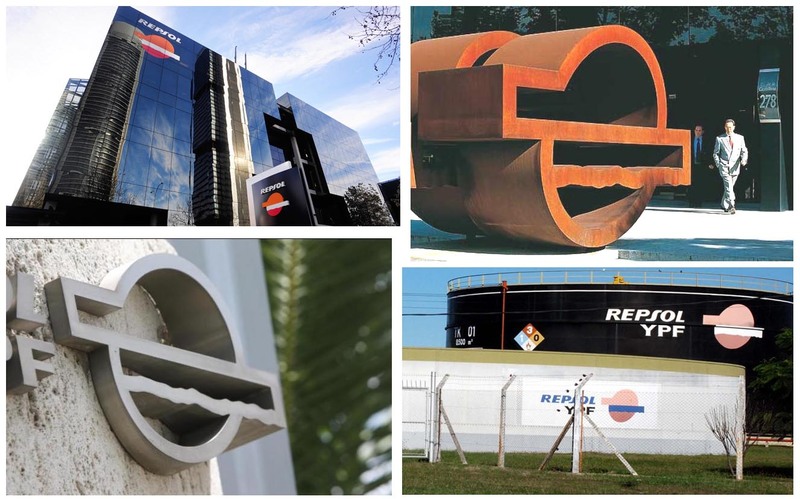 Until this moment, the Spanish company Repsol was the main owner of YPF, who had acquired it when the Argentine governement privatized the national oil company in 1999. The Argentine company has a relevant weight in the Repsol Group. In fact, YPF provides to the Spanish oil company the 17.42% of its revenues (11,105 million euros) and the 25.61% of its gross profit (1,231 million euros). 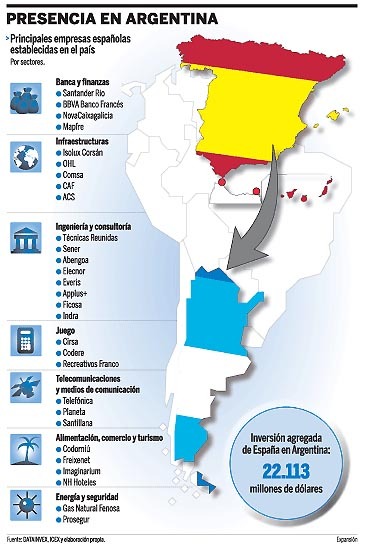 In 2011, Argentina received the group´s largest amount of investment: 2,182 millions, 33% of total. Repsol YPF has 15.119 workers in Argentina, 32% of its total staff, being Argentine the second majority nationality just behind Spaniards. When Repsol acquired YPF in 1999, it became to the 10th biggest oil company in the world. Before this operation, the Spanish company was in the 18th world place. But Repsol had to implement a very hard restructuring plan to return the pofitability to YPF, because the Argentine company wasn´t in a very good situation in that time. With this reasoning, the Argentine government started a communication campaign in which they wanted to present Repsol to the Argentina´s population as the enemy: a foreign and cruel company who was just plundering the money and the resources of the country. By this, in 2011 Repsol YPF suffered a harassment and demolition operation with the cancellation of its licenses in several Argentine provinces: Mendoza, Neuquén, Chubut, Santa Cruz... That was going to be the second step of a strategy to expropriate the oil company. The total expropriation occurred last 17th of April, date in which Cristina Fernández de Kirchner invited governors and related businessmen to Casa Rosada, to anounce that the state declared the 51% of the YPF shares (until this moment owned by Repsol) as public utility and subject to expropiation. Of that percentage, 51% would go to the National Government, and the remaining 49% would go to the 10 oil-producing provinces. In this way, the Argentine government would have the 26,01% of the social capital, and the provinces governers the 24,99%. b) The typical irregularities of a "banana republic"
The expropriation announcement was made by the president of Argentina even before the law-project was sent to the Congress. Until this moment, Repsol was the main owner of YPF, with a 57,43% of its capital. The Argentine oil company is also owned by Grupo Petersen with a 25,46%. This group was owned by Enrique Eskenazi, a banker friend of Néstor Kirchner, the last president of Argentina and Cristina´s ex-husband. 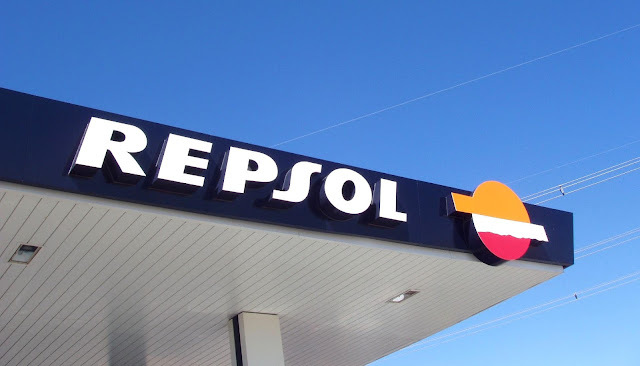 Grupo Petersen had an agreement with Repsol in the profit sharing, due to the Spanish company lent it money to acquire its share in YPF years ago. 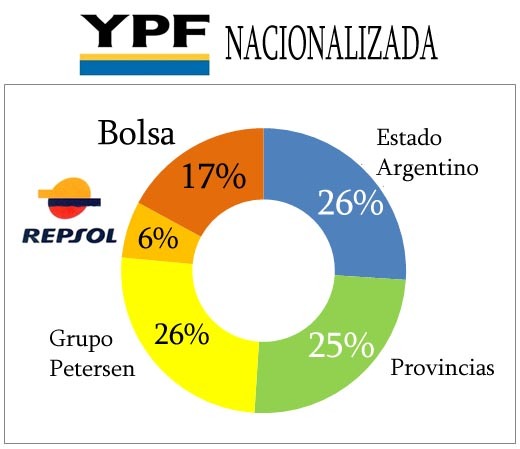 But the truth is that the only share that was expropriated by the Argentine government was Repsol´s: Grupo Petersen (a private group friend of Kirchner) would continue having its percentage in YPF, although the president called the operation "the nationalization of YPF" and "the returning of YPF to the Argentine population". The same day of the expropriation announcement, members of the state security forces went into the YPF headquarters in Buenos Aires and put the managers off from the buildings, without letting them take their mobiles, documents or pendrives. In addition, the Argentine government was quick to say that they weren´t going to pay the price asked by Repsol for its expropiated block of shares: they will pay what they deem appropiated and the Argentine Court say (Argentina would be judge and jury). Isn´t it a steal? 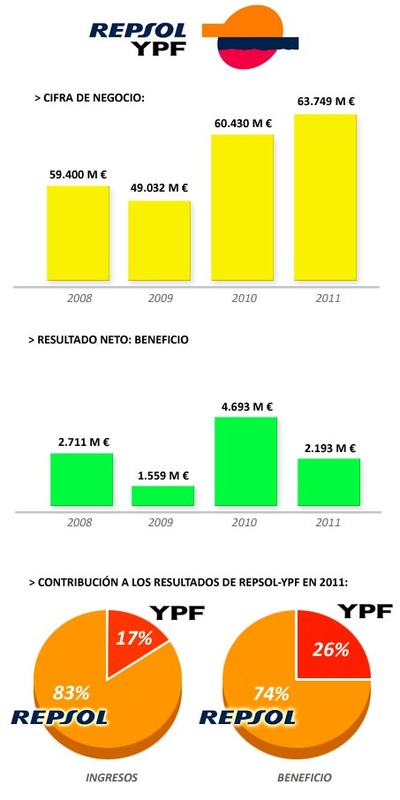 Didn´t have Repsol to pay more than 15.000 million dollars for YPF when the Argentine state sold it in 1999 to gain money? 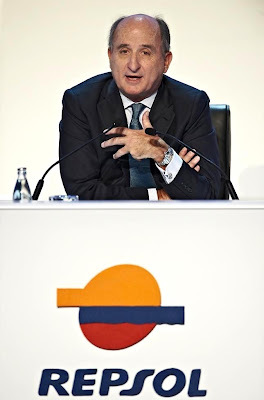 Repsol´s chief executive, Antonio Brufau, gave a press conference in general headquarters of the company in Madrid, to explain the real reasons who had Cristina Fernández de Kirchner´s government to expropiate the share owned by the Spanish oil company. He also explained that Repsol made continued attempts to come to an agreement with Argentina. But apparently, it was impossible to talk with the state authorities and arrange the situation, due to the decision was political, and it was just taken time ago, as part of a plan of the Argentine government. Argentina is crossing by difficult times, with an un happy population (a 30% living below the poverty line) and many economic and financial problems, and this operation could serve to hide the real economic and social crisis in the country and obtain the favor of people. The expropriation can be an attempt to increasing the popularity of Cristina Fernández de Kirchner, who tries to please the people with the "argentinization" (in an illegal way) of the main industrial company of the country, and be showed in this way as the Argentina´s saving. Repsol YPF had invested large amounts of money in research and explorations by Argentina during many years. As result of these explorations, Repsol had discovered in may 2011 very large oil and gas deposits in Vaca Muerta (Argentina) equivalent to 927 million of oil barrels: a very valuable and preciated energetic gem. In fact, this deposits could be a real saving for the growing deficit of the Argentina´s energy balance, that was about 3.000 million dollars last year. The Argentine government had showed its interest to take part in the company since this discovery, and Mrs Fernández de Kirchner had said she was "very very glad by the works of Repsol YPF". The discovery happened in less than one year before the expropiation of YPF, and Vaca Muerta was the inflection point between the relations of the Argentine government with Repsol: the begining of the hostilities against the Spanish oil company to take control over Vaca Muerta. Antonio Brufau explained that the relation with the Argentine authorities had changed since the discovery: before it, the Argentine government supported, potentiated and congratulated to Repsol YPF. But only a few weeks later, the pressures and harassment started against the Spanish company. 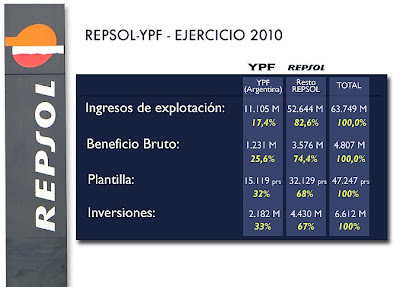 Kirchner´s government had started a hard campaing against Repsol YPF during almost one year, raising uncertainty and hindering the work of the company in Argentina to sink the share price in the stock market, and let an expropiation "at a bargain price". In fact, the continued declides in the stock market have damaged the interests of thousand of small investors who had Repsol YPF shares. 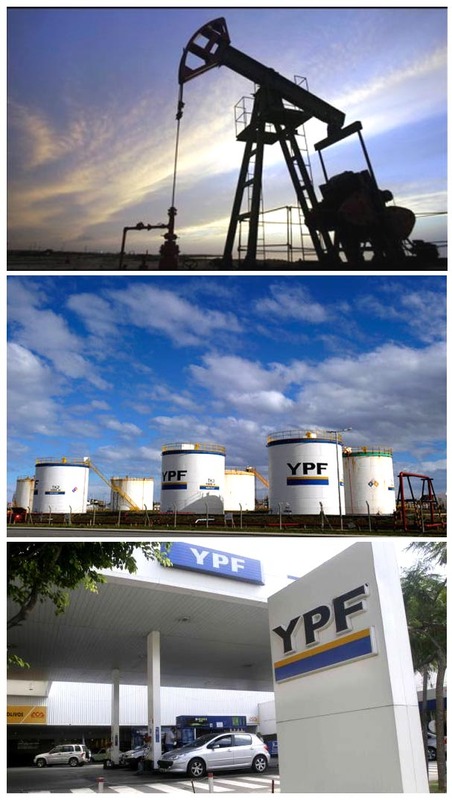 Repsol asks for its expropriated share in YPF to the Argentine government 10,500 million dollars (8,500 million euros), a closer amount to the offer it had received from a Chinese oil company (Petrochemical Corporation - Sinopec Group) interested in its share in the Argentine company time ago. The Spanish company has also announced that is going to sue the Argentina government to the World Bank. 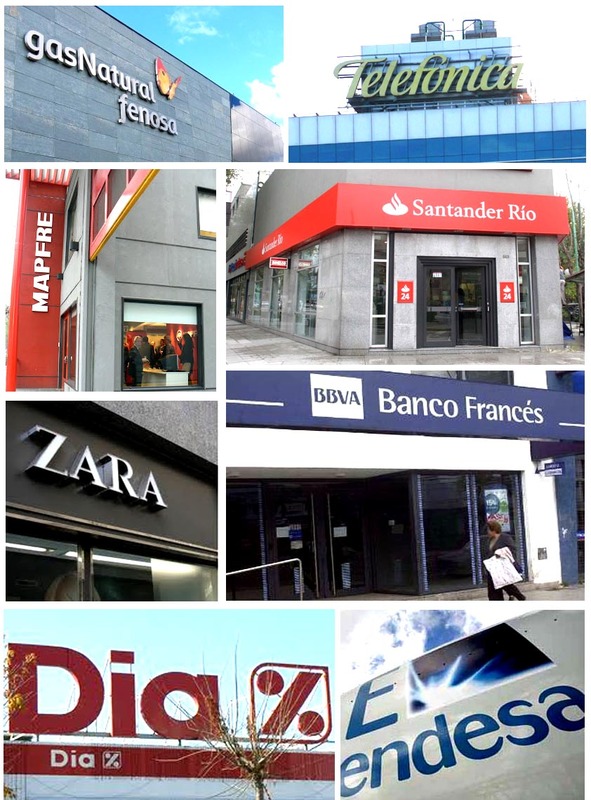 Lawsuits are settled through the International Center for Investment Disputes, in which there have been complaints of other Spanish companies in Argentina like Telefónica, Endesa, Gas Natural or Aguas de Barcelona. This expropriation is the biggest happened in the oil sector since Russia acquired the Yukos assets. But it isn´t the first in Argentina against a Spanish company: In 2009 the Argentine government expropriated the airline Aerolíneas Argentinas to the Spanish group Intervinvest (Grupo Marsans) paying only one dollar for it. In this case the Argentine government refused to look for an independent valuer, and appealed to the Appraisal Court of the Nation (Tribunal Nacional de Tasación) who valued the airline in -830 million dollars (a negative value), while reports of Credit Suisse commissioned by Marsans valued the company between 330 and 546 million dollars. The Spanish government has anounnced they are going to defend the interests of the Spanish companies, and that this kind of actions will be consecuences. The UE has shown their support to Spain, and has started pressure meassurements against Argentina. US has also said they are on the side of Spain. Europe and US agree to say this expropriation is illegal and arbitrary, unbecoming an advanced country, lacks legal certainly, and breaks the rules of the free democratic market. 3. IS ARGENTINA A GOOD COUNTRY TO INVEST TODAY? Definetively, in this moment and with this government, no. The Argentine government has showed they can do what they want, although it can be illegal, unfair or can damage the interests of private investors. This country can´t guarantee legal certainly to foreign investitors. 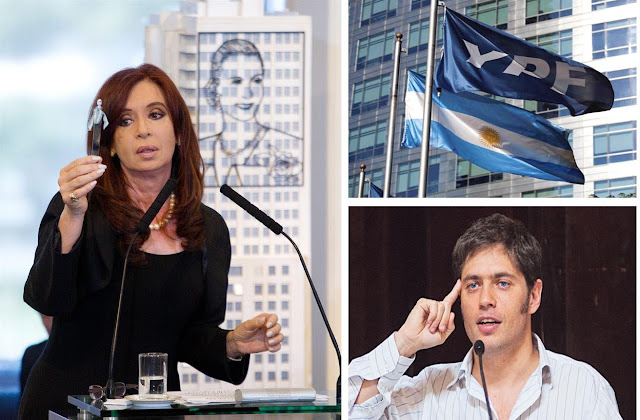 In fact, Cristina Fernández de Kirchner has threaten other sectors like banks and telephone companies, telling them to walk with care, in clearly alluding to Telefónica, Banco Santander, BBVA and other Spanish companies who work in Argentina. Despite of this, Argentina is one of the main destinations of the Spanish companies, who invest in that country creating thousands of jobs and wealth for Argentina. 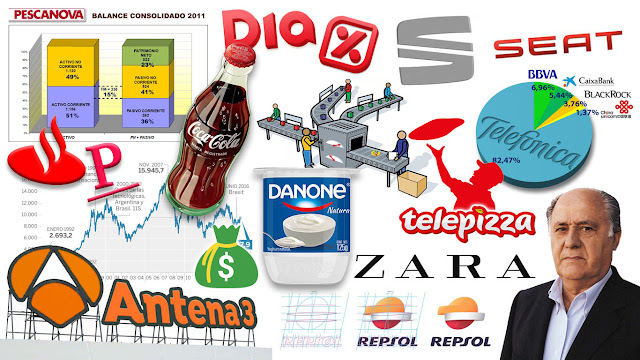 In addition of petroleum (Repsol), sectors as banking (Santander, BBVA, Novacaixagalicia), insurance (MAPFRE), telecommunications (Telefónica-Movistar), hotels (NH Hoteles, Sol Meliá), security (Prosegur), food industry (Pescanova, Pescapuerta, Armadora Pereira, DIA, Freixenet, Codorniu), publishing and media (Planeta, Prisa), fashion (Inditex, Mango), energy (Gas Natural Fenosa, Endesa, Aguas de Barcelona), building (OHL, ACS) and many more has an important Spanish presence. With this kind of actions, the only thing that the Argentine government is achieving (far from protect the interests of Argentina) is increasing the perceived risk to invest in this country, frightening the private potential investitors. In fact, some companies have started to change its location from Argentina to another nearby countries like Brazil. What´s more, the risk rating agency Standard & Poor´s has just lowered the calification of Argentina´s sovereign debt last 24th of April. 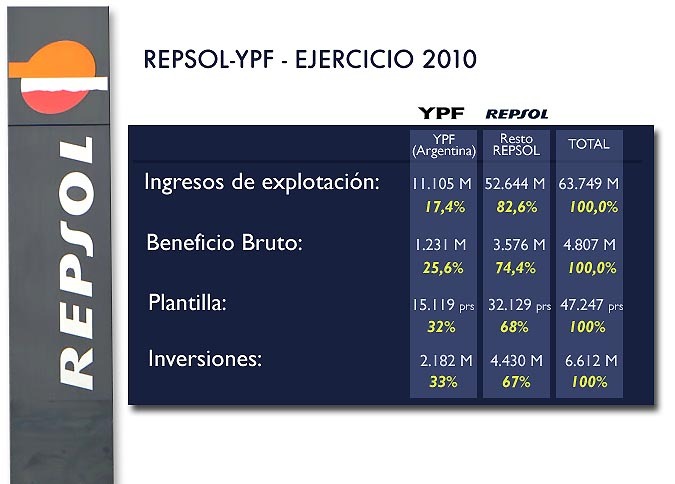 The calification of Argentina was already bad (junk bonds), and following the case of Repsol YPF now it is worse.